Last week I preached about a topic called Subsidiarity. It really takes root in 1 Corinthians 12:12-26. I love the term but it can easily be confused with just trying to make things more efficient. It should not be looked at that way. Instead, it should be seen as a way to make a system more effective. In mechanical terms efficiency and effectiveness are almost always synonymous. Make a machine better, faster, and more error free and you will get a more effective machine. But people are not machines. In fact, the more you treat people like machines the more they break down. I think discipleship demonstrates this principle very well. The harder we try to streamline the process the worse it becomes. The more we try to do it in mass, the less it sticks. By spending time on marketing, presentation, and expedition the less effective we truly are. Efficiency says, “let’s try to make this happen faster.” Effectiveness says, “let’s spend as much time as it takes. I don’t know about you, but I want to be effective for Christ, not efficient. I’m not sure Christ will be impressed with our focus on efficiency. I know he will be pleased that we tried to follow his model of making disciples. I really like this video by Ken Robinson, a pioneer in education. If you just replace education with “Religious Education” or Discipleship” I think you will see a very similar trend in the U.S. There are so many instances where the pressure to perform eclipses the awe of God and it causes many to drop out of church. How can we be more effective rather strive to be more efficient? Yeah especially living in a technological age. The twin E’s! While the focus should not be on efficiency it needs to be a part of what we do and who we are. Without it that 3 year discipleship with a group of 12 might have stretched into 10 years and would those 12 really be more prepared at the end of 10 year than they were at the end of 3 years? 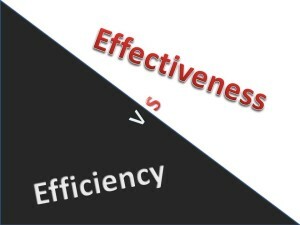 Yes, we need to focus on effectiveness, but effectiveness is always balanced by it’s twin. Otherwise we might be effective in equipping a person, but at some point it is more efficient to turn this person loose and become efficient by giving the opportunity to turn 1 effective person into 2 effective people. I think the key is which twin one will be our main focus, but the other is always close behind it. Right?